Pierce has had a loose tooth for months. I never knew a loose tooth could drag on so long. He waited and waited and waited. He wiggled and ate apples and pulled. The dentist even said (a couple of weeks ago) "Surely this will fall out tonight!" But it hung on. Finally, though, one day last week Pierce jumped off the bus with excitement. The tooth had fallen out. 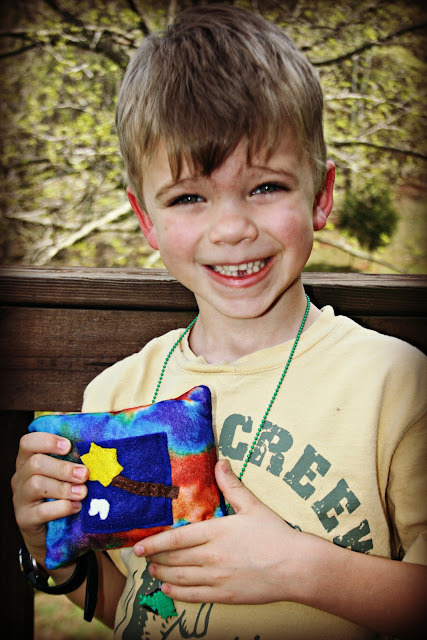 I got out the little tooth fairy pillow I made a couple of years ago just for this momentous occasion. Luckily, the tooth fairy did remember to come visit Pierce that night. I was a little worried she might forget. I heard she's been a little overtaxed lately. I think the pillow I made was a beacon reminder to her. Do you remember losing your first tooth, readers? Aww! How sweet is that face- he looks so proud. I remember my kids used to get 50 cents. I think the going rate is a bit higher now! What a great idea to have that tooth pillow ready for just this occasion. I should make one for my Grandson. Losing that first tooth is a big deal!! Amy lost one on the train once, and talk about the tooth fairy having to get creative in that situation...! I love the pillow! I may need to have a beacon for the tooth fairy at my house. Cool pillow! You are far more crafty than I am! I don't remember losing my first tooth, but I remember my youngest losing his (it wasn't that long ago). So cute! I don't remember the first tooth, but I remember the days of wiggling and doing different things to lose them. I am so happy to have you as a Blog - neighbor . . .
LOVING the big smile!!! His first? Is there anything cuter than a kid smiling with the a missing tooth? I bet he is happy to have it gone! I have heard that with inflation and all, the tooth fairy has to pay through the nose now...if fairies have noses. Oh how sweet... What a cutie!!! Congrats to Pierce... Glad the tooth fairy visited. Back when my sons were little, a dime or quarter was a HUGE gift... These days though, I'm not sure what it would buy!!!!! He's such a cutie! Happy for him! I had a tooth that hung on like that. I think everyone in the family worked on it, trying to wiggle it out. I don't remember losing my first. Mica was terrified thinking something was wrong, and that it may not grow back. I didn't even think to talk to him about it. That is great the tooth fairy stop by. I know how busy she can be. Lol, he sure does look happy. My youngest is 12 and is still losing teeth. Doesn't get any cuter than that. I LOVE the little pillow you made. He is adorable! I actually don't remember when I lost my first tooth, and we don't really have the tooth fairy tradition in Romania. What an appealing photo! He has a great smile. He looks adorable with that little gap in his smile! Dylan's first loose tooth was loose for an entire year before it fell out! I didn't think it was going to!